The understanding of how receptors accumulate within the developing synapse has captured a lot of attention. Lateral diffusion of surface neurotransmitter receptors has emerged as a key pathway to regulate receptor trafficking and surface distribution, in addition to the receptor cycling between intracellular and plasma membrane pools. The neurotransmitter receptor lateral diffusion depends on several factors, such as interactions with other proteins highly enriched within the synaptic structure. 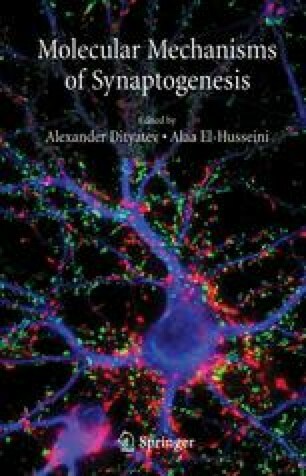 During synaptogenesis, receptors aggregate and cluster within developing synapses. As described in this chapter, lateral diffusion of receptors is likely to play an important role in such process since receptor lateral diffusion is high during synaptogenesis, providing favourable conditions for the “capture” of receptors within synaptic contacts. Indeed, the “diffusion-trap” model for receptor accumulation in developing synapses has now gained experimental support from excitatory synapses, although direct evidence to test this model is still lacking due to the absence of adequate tools to precisely control extrasynaptic receptor lateral diffusion. Within the developing synapse, it also emerges that neurotransmitter release generates surface instability of the receptors and their stabilization requires additional factors.